Quiet. Powerful. Inexpensive. Pick two of the three above qualities, and that pretty much sums up the choices most of us face when designing an exhaust system. Traditionally, it’s been impossible to tick all the boxes. That pleasant-sounding, budget-priced street muffler is most likely robbing power. Need more power without spending much? Get out the ear plugs. Need quiet and powerful? Reach for the gold card, especially if it needs to be lightweight, too. Even spending more on a muffler doesn’t guarantee performance, either in power production or sound attenuation. There is hope, though: Some careful planning and the right approach can produce a system that does it all. The recent introduction of universal sound restrictions for all SCCA national-level autocross events has caused a lot of competitors—us included—to reevaluate their exhaust systems. Certain sites around the country have required sound control because of their proximity to residential areas, but now everyone has to tone it down. Why the change? Moving the Tire Rack SCCA Solo Nationals to Lincoln, Nebraska, had a lot to do with it. To preserve access to this amazing piece of concrete, the rule makers decided to be good neighbors and keep things on the quiet side. Since this was a new policy, officials decided to use it on a trial basis at every national event in 2010. The goal was to train and educate competitors, and hopefully cause some trickle-down culture change in the regional ranks. While the rule book already contained restrictions requiring all cars to have adequate mufflers, the determination of “adequate” was left to the event chairman. That meant every event could allow different noise levels. 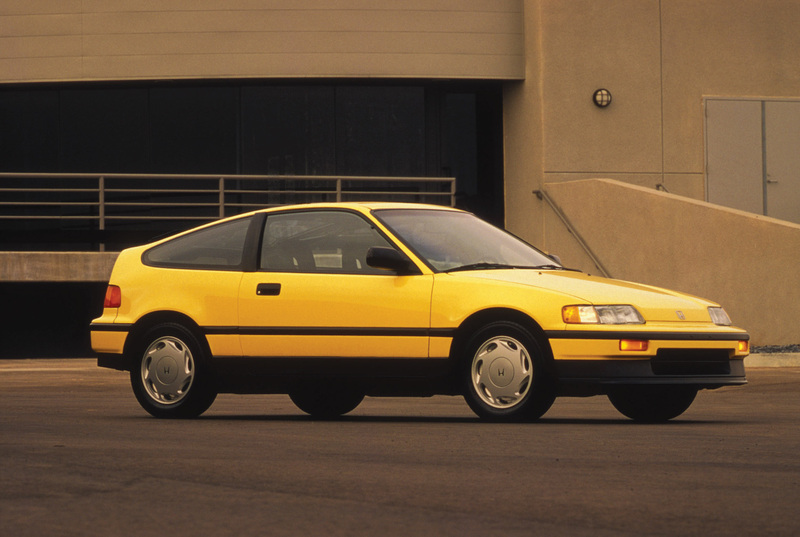 Still, cars were relatively quiet until the Golden Age of Neons back in the mid-’90s. Thanks to Chrysler’s huge contingency and race support program, many top drivers were lured into driving their products. Competition was keen, and even the smallest performance edge could mean a difference in finishing positions worth thousands of dollars. Soon, muffler “adequacy” was tested in the pursuit of more power. Anyone who was around these cars at the time remembers how painful an un-muffled, high-revving four-cylinder can be. These tactics quickly spread to the regional level and then on to other cars. It became commonplace for many drivers—no matter the car or the venue—to fashion a straight pipe that terminated with a turndown. The idea was to save weight and maximize power. Cars got louder and louder until something had to give. Pretty soon, course workers were just as incensed as the neighbors. The new rules require that cars produce a noise level no higher than 100 dB as measured at 50 feet from the course edge. This isn’t nearly as strict as the 93 dB limits required in many regions, but it definitely removes the ear-bleeders. Competitors are warned when their readings exceed 97 dB. If they surpass 100 dB, they’re required to make “repair actions” in order to take additional runs. Once a car has been north of 100 dB for three runs, subsequent runs above the limit are disqualified. Since national events are two-day affairs, competitors can easily lose all of their second-day runs. 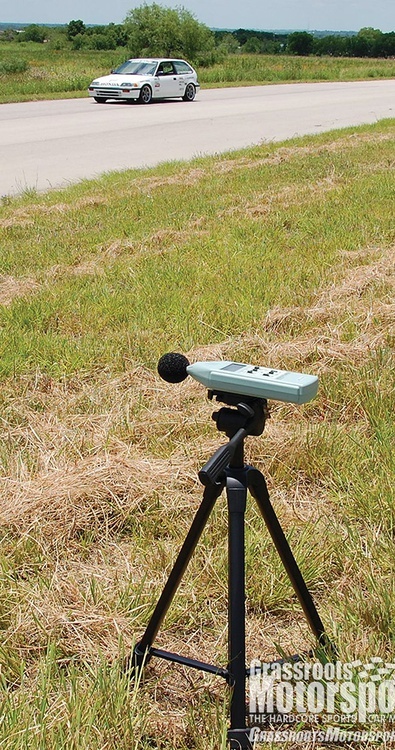 A sound pressure level meter measures the intensity of sound waves at a given point and reports that energy in decibels. It’s a logarithmic scale, so an increase of 10dB is perceived as double volume. Measuring sound levels is as much an art as it is a science. Weather can have a huge impact on readings, both with respect to air density (temperature, humidity and altitude) and wind. Since sound is typically additive, reflections from nearby buildings also have an effect. So does noise from other cars running at the same time. The meter’s location also has a dramatic influence on the readings, since sound levels vary depending on the square of distance to the microphone. Since the exhaust note is usually projected from the rear of the car, the highest readings are typically recorded as the vehicle is moving away from the meter. There is a sweet spot that shows the highest instantaneous readings: It comes when the car is still relatively close, but far enough away that the exhaust output is pointed mostly at the meter. If the course turns cars away from the meter as they pass it, more of the rearward exhaust projection will be exposed, causing a higher reading. If the cars are turned toward the meter, the device will see more of the car’s side instead of the rear, lowering the reading. Given this variability, competitors who play close to the edge should always be prepared with some sort of Plan B in case they register too loud at an event. 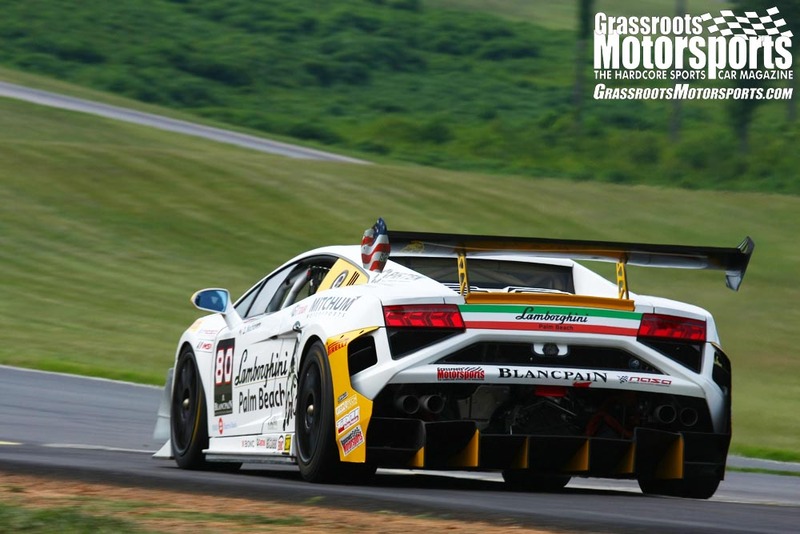 Competitors with sound regulation needs frequently turn to SuperTrapp’s adjustable muffler. We’ve used one for several years on our Street Touring Civic autocrosser and it has served our needs well. The SuperTrapp features removable end cap plates. More plates allow increased exhaust flow, but at the expense of more noise. Fewer plates quiet the system, but this restricts flow and can cause power loss. Understanding the relationship between noise and power can allow a driver to quickly make changes should the sound chief come a-calling. Another method of altering sound levels is through deliberate dispersion and reflection. The turndown is an effective device in this regard: It sends the sound waves down into the ground, losing some through absorption and dispersing the remainder in a variety of directions—ideally away from the meter. Taking this one step further, it’s possible to clock the turndown to point the output directly away from the meter. While this involves questionable sportsmanship since it defeats the measurement process rather than the noise itself, it can come in handy as a last resort. To give an idea of how much meter readings can fluctuate, our Civic Si’s readings varied by plus or minus 6 dB at this year’s national events. We also used the opportunity to play around with turndowns, turnaways and plate counts to get an idea of how each one affects relative sound output. Despite this effort, we’ve still gone over the limit on several occasions, and there are some sites we’ll be visiting that have even lower limits. We had some work to do. And besides, who wants to be “that guy with the loud car,” even if your ride does barely meet the limit? Hey, Turn That Thing Down! 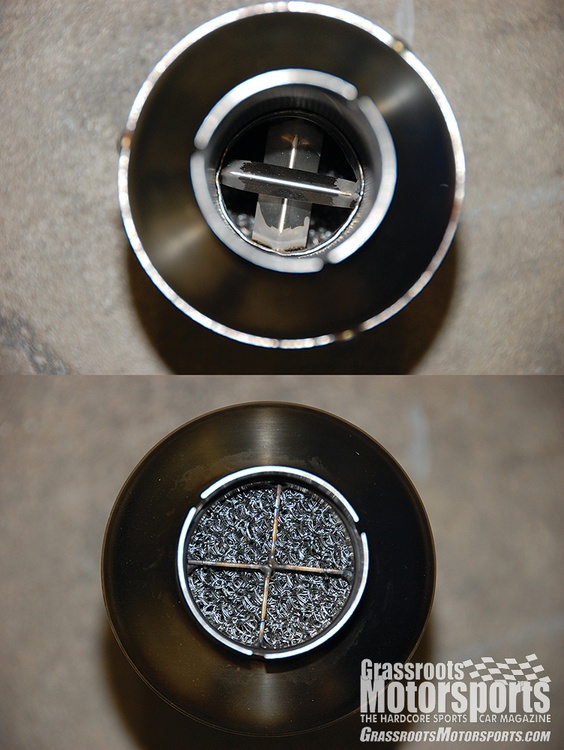 A Burns 2-stage muffler uses clever inlet (left) and outlet (right) construction to offer robust performance in a lightweight, compact design. Rather than resort to stopgap measures, the best approach may be to simply install a better muffler that is both quiet and powerful. But where to start? For answers, we contacted the exhaust experts at Burns Stainless. They have an excellent reputation for building high-quality racing mufflers that really work. Burns built a pair of straight-through mufflers for our Civic so we could study the effects of muffler length on noise and power. They also provided one of their new two-stage pieces; it features a straight-through front section backed by a proprietary second stage that contains deflectors and stainless steel mesh. When asked how it works, a Burns representative would only tell us that it “acts like a Helmholtz resonance chamber,” similar to what you might see in a production vehicle’s intake system. This muffler is designed to provide sound attenuation over a greater range of frequencies than a single stage while minimizing additional power losses. With our shiny new parts in hand, we headed to the track at Harris Hill Road to get some sound readings. The dB meter was set up according to the SCCA procedures (“A” weighting, “slow” response) and we began doing acceleration runs along the front straight. We made a pair of runs with each exhaust configuration, then averaged the results. Occasionally we took a mulligan if the wind or the meter’s low sample rate produced an outlier result. In fact, with those variances in mind, we ran the SuperTrapp baseline configuration three times during our test day: at the beginning, in the middle, and again at the end. This would ensure that our conditions were consistent. To measure power output, we visited Subaru tuning powerhouse Cobb Tuning for some time on their dyno. We made a pair of runs from 2000 to 7500 rpm with each configuration, and the highest readings were used for comparison purposes. The sound data from the various SuperTrapp configurations matched our practical experience fairly well—except for the turndown. Turndown is usually good for 2 dB of sound reduction, but on this day it knocked off 2 to 3 dB, making it a good interim step to the plated setups. From there, sound was significantly attenuated as we pulled out plates. Unfortunately, anything more than a 4 to 5 dB reduction in sound—13 plates or fewer—started to lose power. What did we learn? While many autocrossers and racers have used the SuperTrapp and turndown method to meet sound readings, this setup doesn’t yield much room to maneuver without sacrificing power. Enter Burns Stainless with a solution. Both the uncorked SuperTrapp and Burns single-stage units feature some similarities, including straight-through designs and perforated center tubes fit inside fiberglass-packed stainless steel casings. Each of our test mufflers have similar measurements, too: 2.25-inch inlets and overall lengths of 17 inches. Prices are also in the same ballpark, with both units costing between $200 and $300. There were some differences, too. Burns packs its fiberglass more tightly, which apparently delivers more power and attenuates more sound. Thanks to a larger outside diameter (4.5 inches versus the SuperTrapp’s taper from 3.5 to 4.5 inches) and smaller inside diameter, the Burns unit also appears able to carry more fiberglass. A larger muffler will typically control sound better than a similar smaller unit. “For an absorption-style muffler, the packed volume is a strong predictor of muffler performance—the larger the muffler, the more sound attenuation is achieved,” explains Vince Roman of Burns Stainless. 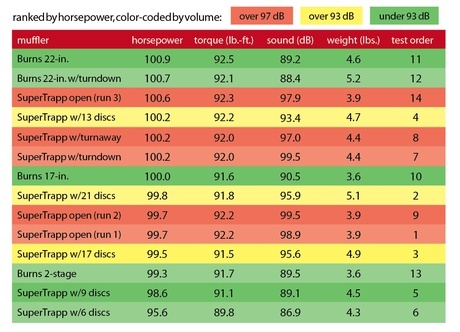 “A larger volume is almost always quieter, regardless of if you get it by larger O.D., longer length, or smaller I.D.” Our results dramatically back this statement. While the two 17-inch-long mufflers make the same peak power output, there is a full 9 dB difference in sound output. Looking at it another way, it would take a SuperTrapp configuration with less than 13 plates—and a power loss of 2 percent—to equal the sound levels of the Burns product. We performed our dyno testing at the Cobb Tuning facilities in Texas. After our first battery of tests, we wondered if we could make the car even quieter without losing any more power. Vince Roman cautioned that these gains wouldn’t be easy to achieve, however. “We have noted [that] trying to attain more attenuation by adding length follows the law of diminishing returns,” he says. “Also, absorption mufflers have frequency dead zones—that is, if the sound energy is at a frequency that the muffler does not attenuate, additional length will not help.” Nevertheless, we ran our tests with a 22-inch Burns muffler in place. The lower sound levels (a 1.3 dB drop) didn’t surprise us too much, but the horsepower readings were impressive: The longer muffler actually made more power than the short muffler. The power gain was only 1 percent, but that was a real and repeatable advantage. The people at Burns had a plausible explanation for our results: “Performance is a strong function of the tailpipe/exhaust length and is related to wave tuning. It appears that this system likes a longer pipe.” They noted that an even longer muffler could help our car further, but that isn’t the case with all engines. “This result disproves the common myth that a short muffler is always better for power,” they continue. “In addition, a 22-inch muffler does not have the same tuned length as a 22-inch-long pipe. So even if an attempt is made to keep the overall exhaust length the same, differences in tuned length could still result.” Could we make it better? Why yes, we could. Adding a turndown made the 22-inch Burns even quieter, though the same move provided a bigger drop with the SuperTrapp. This isn’t surprising, since the Burns unit is quieter in the first place. Before packing up everything, we tested one more Burns muffler, an innovative 17-inch, two-stage piece. Burns says that these two-stage mufflers are especially useful when packaging constraints limit the actual size of the muffler and even more sound attenuation is needed. Compared to the 17-inch, single-stage muffler, the two-stage unit only lost 1 percent of peak power at high rpm yet delivered the lower sound output of the 22-inch, single-state unit. For high-output race cars, this is a great solution. This test taught us a lot about tuning for sound and power. In the end, we were able to achieve dramatic results in both categories. We’re now well equipped to meet even the strictest sound regulations of any active autocross site in the country. This is especially important because restrictions may become tighter. 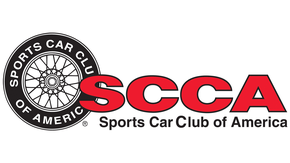 SCCA rule makers have hinted that the initial 100 dB limit will likely go down as the organizers get better at the sound-monitoring process. For sure, more regions around the nation will introduce these procedures to be good neighbors and keep their precious sites. The take-home lesson, however, is that there’s no one answer. If you want to maximize performance without getting busted by the sound police, some testing is a must.